This recent news came from UK newspaper 'The Daily Star', but I'm not 100% how true it all is... Take it all with a pinch of salt. The writers have supposedly decided to "rest'' the couple [Amy and Rory], who are hugely popular with fans, for the time being. However, they won't be killed off. Amy and Rory will announce they want to head back home and settle down. One plan is to have them appear as "stay-at-home'' assistants for The Doc, helping him out from Earth from time to time. A source said: "There are going to be a lot of tears in the finale. The Doc will set off in the Tardis for his next adventure on his own. "Amy and Rory will be reunited with their baby Melody Pond and they make a decision to stay on Earth to settle down as a family. "But TV bosses are well aware the couple have been popular so this won't be the last you see of them." Also everyone's favourite Time Lord will apparently get married at the end of season six, in the last episode, set to air on Oct. 1. Word has leaked that the Time Lord (Matt Smith, 28) is getting hitched in the show. 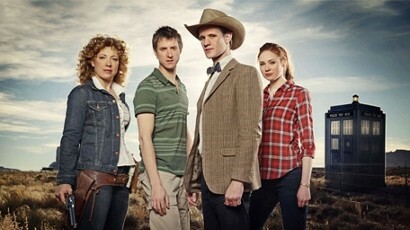 The hot name in the frame is River Song (Alex Kingston, 48). The final two shows are ''Closing Time'', in which the Doc is reunited with lodger James Corden and battles the Cybermen, and ''The Wedding'' - a marriage, and a farewell to Amy and Rory.